JD Commercials Ltd has been a commercial vehicle repair centre for 24 years and has close ties to the DVSA through MOT’s and as a DVSA approved tacho centre. Twelve years ago we embarked on our journey into road haulage. Dave Titterton, Managing Director, will guide you through the changes made when incorporating a haulage division to the company and explain the continued benefits of being a FORS operator. We were asked by a large customer of ours if we were FORS registered, at the time we were working on ‘Crossrail’ scheme so were aware of FORS. As with most accreditations we felt very pressured and a little reluctant to commit to such a big undertaking. After numerous meeting and consultations between myself, our Transport Manager and other key members of the team we decided to commit to FORS. The decision was made, we were all in agreement that we wanted to achieve FORS Gold. We met our first assessment with some reluctance and it showed in our result. When we passed our re-assessment we quickly learned that embracing everything FORS was the ay forward. We followed this with the Silver accreditation which we passed first time. This solidified our position on deliveries into London and our customer base has increased. Since embracing FORS our company has transformed both economically and operationally. We completed the Gold Practitioners course in March this year and have continued to make the most of what FORS has to offer through Safe Urban Driving, in-house workshops and e-learning to name a few, making our drivers some of the most highly trained in the industry. Our vehicles now have an extensive safety standard as they enter service, as a commitment to drivers, vulnerable road users and the environment alike. Our FORS standards can be measured by our extensive reporting processes and the reduction in our traffic incidents and collisions. We have had a Vulnerable Road User Policy for a few years which has been complimenting the workshops and the Safe Urban Driving training the drivers have been completing. Low staff turnover, safety specific kit on vehicles and training come together to help us manage traffic and collisions and we have seen a reduction of 50% on the base year and have been injury free on all collisions since 2014. This is one trend we wish to keep going with. Our main reason for wishing to progress to FORS Gold is to show our desire for excellence. By holding the Gold standard we illustrate to our customers, other road users and members of the public our commitment to safety, risk reduction and legal compliance. With regular driver training and assessments our MPG has improved drastically since the base year. This is a cross fleet figure based on our artic’s achieving approx. 9mpg, rigid’s 13mpg and pick-ups 19mpg. Our PCN’s have decreased somewhat but due to the nature of our business and the frequency our vehicles are in London, parking charges are simply the nature of the beast. The incident rate has gone up from previous but the majority of these are non-fault to JDC. For us a healthy driver is a happy and useful driver. Ensuring the reduction in absences and vehicle down time from ill health is paramount. We request completion of regular medical questionnaires from our drivers and offer advice where needed as a result of those questionnaires. Our driver room contains numerous posters regarding how to stay healthy, reducing bad habits i.e. smoking and bad diet and how to stay fit in the driving seat, stretches etc. Our recruitment procedures are all in-house. We use Indeed, Facebook and our local newspaper to find candidates then we perform interviews and driving assessments to decide if they are ‘the right fit’ for our company. We have implemented a Noise Reduction Policy which all our drivers are aware of and is on display in our drivers’ room. Our drivers are all aware of the Noise Act 1996 and to therefore not make deliveries until after 7am. We also monitor the drivers harsh breaking, over revving and idling to reduce noise on the road and on the yard or on delivery sites. We are constantly looking into the possibilities of multi modal and other forms of groupage but unfortunately our custom base does not lend itself to this type if operation as we are predominantly lorry crane deliveries and/or moffett offloads. Should things change with HS2 etc we may revisit the issue. We will be keeping abreast of the situation. At the beginning of 2018 we had no Euro 6 vehicles, by the end of August we now have 9 and over the course of the next 18 months we intend to upgrade the whole fleet. 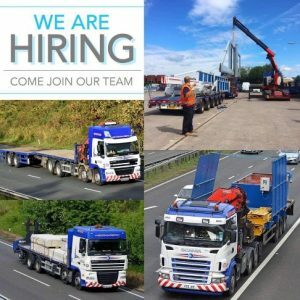 As the majority of our customers are based in the Stoke-on-Trent area and with the bulk of our work being temporary hire or ‘back to base’ loads, it doesn’t make sense for us to have additional operating centres. Although one of our customers who mainly deliveries into the London area has recently moved their storage facilities to Tilbury and Southampton to facilitate quicker deliveries and reduce environmental impact. This therefore means we can base our vehicles closer to London during the week reducing mileage and decreasing our carbon footprint. Our aims going forward will be to retain our FORS Gold standard (once achieved) and be an example within our industry. To achieve FORS Gold would be just reward for our team who have worked tirelessly to reach this pinnacle. Then the real work starts maintaining and improving the standard going forward. You can find us on Facebook and Instagram where we regularly update our customers on our achievements and post photos of our vehicles promoting the FORS standard. 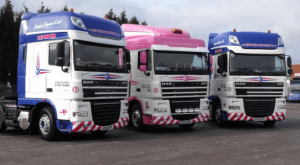 Read haulage contractors Grewlage FORS case study.